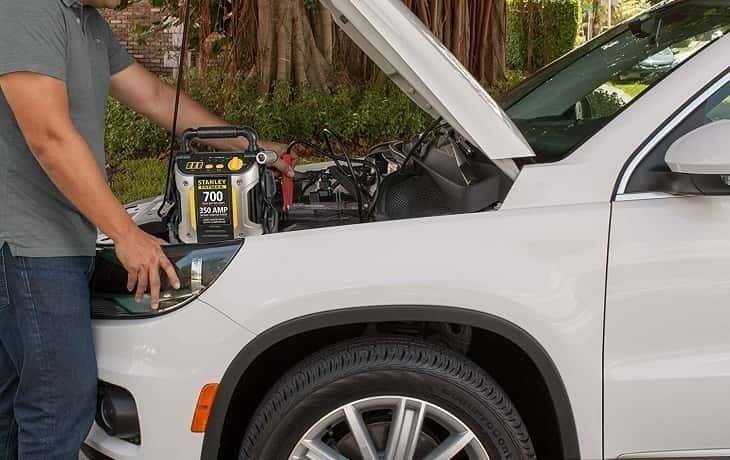 When the inevitable happens and you find yourself with a weak or a dead car battery, then only a jump starter can save you from having to jump-start your car using another car's battery. 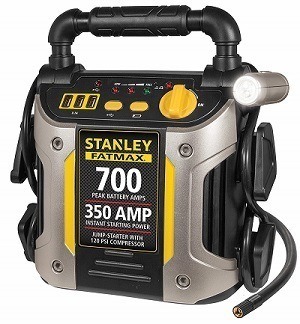 Jump starters have developed quite well over the years, so today, you find them with lithium-ion batteries and with extra features like producing compressed air, offering USB charging ports, and torchlights for working in the dark. In this jump starters review, you'll learn about the important features that you need to watch out for when making a choice, plus you get a list of the top jump starters in the market to choose from. This offer from DBPower is a little more than a mere car jump starter because it comes with lots of extra features that make it a true multi-talent. Starting with up to 600 Amps of peak power delivery and up to 18,000 mAh of stored power, it can crank gas engines that are up to 6.5 liters large and diesel ones up to 5.2 liters. In addition to that, it offers 12 V and USB charging ports for your different smartphones and tabs, as well as a torchlight with strobe and SOS functions for emergencies, plus a compass to help lead you back home if you're lost. One thing you might not like about this offer is that the jumper cables are rather short at 4 and 6 inches of length, but the package also includes an 8-in-1 laptop charging adapters and it's backed by a 3-year manufacturer warranty. Featuring a rugged and fireproof outer casing, this top-rated jump starter from Jaco offers you plenty of other valuable features as well, including Jaco's lifetime satisfaction guarantee. It comes with a 16,500 mAh battery, which holds enough power to charge your laptops and mobile phones many times over and to jump-start your car's engine up to 30 times on a single charge. The package includes the necessary cables and ports to make this a truly multi-functional device. You get two USB ports and a 3-in-1 USB cable with different plugs for different devices, including Apple and Android devices. There's also a LED emergency flashlight with SOS functions, an LCD monitor to keep you up to date, electrical safety features, and a heavy-duty carry case to protect the jump starter when not in use. 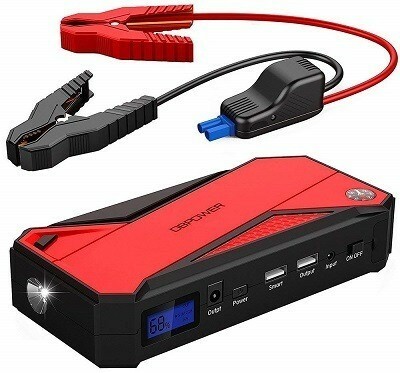 Here's a great offer for those who are looking for the best portable jump starter. It measures just 8 inches in length and fits beautifully into the palm of your hand. 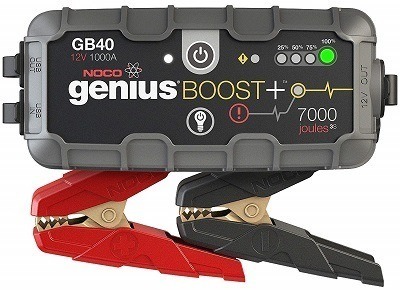 The GB40 from Noco is a 1,000-Watt jump starter, designed for gas engines up to 6 liters and diesel ones up to 3 liters. If you need more power than this, then Noco also offers other models with peak powers ranging from 1,500 Amps to 4,000 and even 20,000 Amps. Although its warranty is only for a year, it includes nice features like a 100-Lumen bright torch, battery level display, USB ports for charging, and safety features to prevent electrical sparks or accidents. 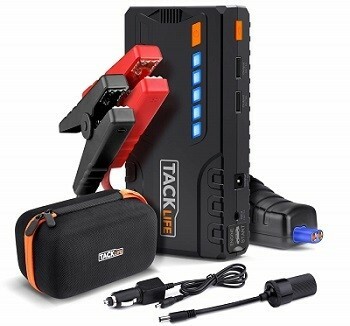 This Tacklife T6 jump starter comes packaged in a rugged, durable, and fireproof housing, guaranteeing you a device life that's as long as possible. It holds up to 16,500 mAh of electric charge and delivers 300 Amps of starting power, with a peak of 600 Amps. On a full charge, it will jump-start cars up to 6.5-liter gas or 5-liter diesel engines up to 30 times. Although it includes a LED flashlight, it's not the brightest light in this review, but it does feature strobe and SOS signals, making it a valuable device in times of emergency. The package includes smart jumper cables, USB cables, a car, and a wall charger, as well as a 3-year warranty on the car jump starter. 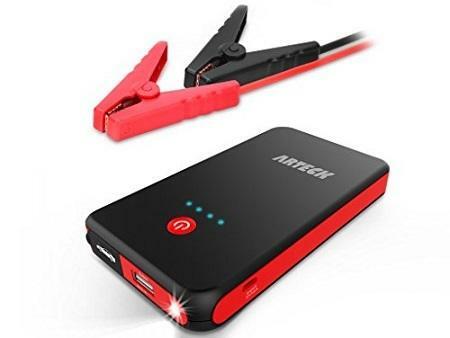 If you are looking for the best car jump starter for extreme weather, then this offer might have something for you that other offers don't. Most jump starters only work well in normal room temperatures, but once things get too cold or hot, the results can vary from jump starter to jump starter. 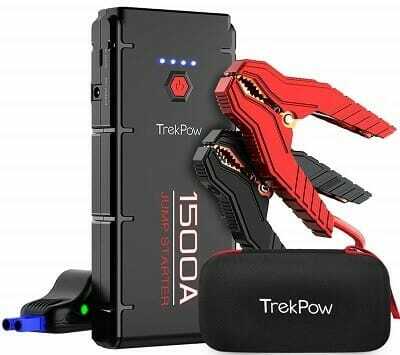 With this Abox Trekpow, you're guaranteed a working jump starter in temperatures as low as -20 and as high as 65 degrees Celsius. It comes with 1,500-Watt peak power, two smart USB ports, a 16.8-Volt DC port, built-in LED torchlight with emergency functions, and Abox backs it with a solid 3-year warranty. 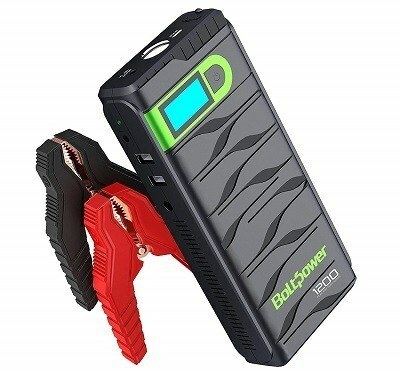 Featuring small dimensions and relatively low peak power, this offer is the smallest car jump starter so far in this review and it also comes at a very low price. The included battery has an 8,000 mAh capacity and a peak power of 300 Amps. This means that it can only jump-start small engines and it's rated to 2.5-liter gas engines at most. It includes a LED flashlight with strobe and SOS signals, safety protection features like surge and short-circuit protection, plus a full recharge takes just four hours. Although it comes with a 2-year warranty, this jump starter is obviously for small cars, so it's no use for higher-powered vehicles. It also offers only one USB port, and its flashlight's intensity can't compare to others in this review. 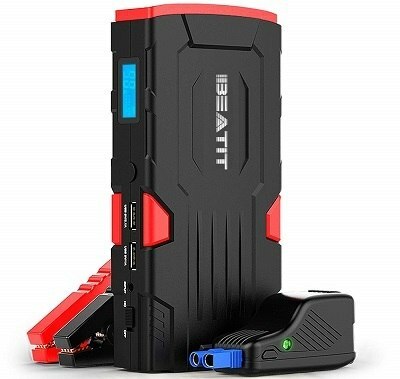 The Beatit BT-D11 is a stylishly designed black and red jump starter with a power bank feature. It's also one of the best jump starters in the market because of its additional circuit protection features. It comes with an 18,000 mAh battery capacity and an 800-Amp peak power. Beatit states that it's able to jump-start gas engines up to 7.5 liters and diesel engines up to 5.5 liters. There is also a multi-functional LCD monitor with status, charge, and operating mode updates. Its jumper cables feature spark-proof and reverse polarity protection and Beatit backs it with a 2-year warranty. 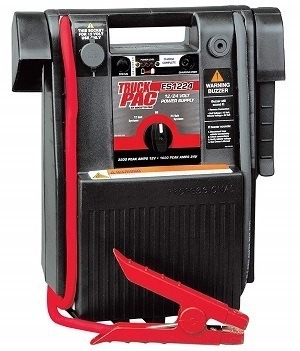 Clore Automotive's Truck PAC ES1224 is a 12/24-Volt car jump starter, designed for large batteries and engines. It comes with a switch that lets you select between the two voltages and an Off position. 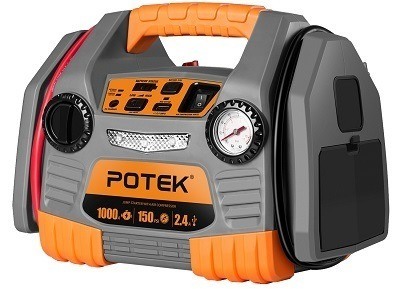 When in 12-Volt mode, this jump starter has a 3,000-Amp peak power and 750 cranking Amps. In the 24-Volt mode, it has 1,500 peak Amps and 370 cranking Amps. This system is specifically designed for jump starting vehicles and does not include much else. So, there's no torchlight, no USB charging ports, and no compass. There's a 12-Volt DC port on this device though, which is great for powering accessories. The system also comes with industrial grade Hot Jaw clamps, a LED indicator, and a 1-year warranty from Clore Automotive. Bolt Power also has an offer to make here with its N02 Beast model, designed to look compact and sleek, but packing plenty of power up to 1,200 Amps. The housing includes an LCD monitor to show battery charge level and to display the output at the two USB ports. Each of these USB ports is a Quick Charge 3.0 output, ideal for quickly charging mobile phones and tablets. Safety features are also available, and they include all the standard functions, such as over-current, over-charge, and short-circuit protections. It will withstand temperatures from -20 to 130 degrees Fahrenheit, making it a more universally applicable jump starter. Bolt Power also includes heavy-duty clamps, although they come with rather short cables. The jump starter comes with a 1-year warranty, which isn't much but it's okay when you consider the N02's price. 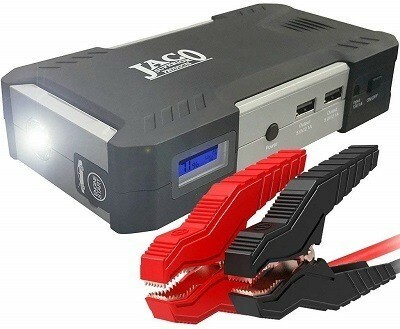 There's no limit to the type of accessories that can come with a car jump starter, the important thing is that it makes sense, just like this one with its extra tire inflator. The basic device is a 1,000 peak Amps jump starter with a USB port for charging your mobile devices and it comes in a beautifully designed box that is reminiscent of a 1960s radio. It includes a main On/Off switch, an air gauge, and a working light in the front panel, with its jumper cables wrapped around each side of the device. You'll also find a 12V DC power outlet on the side, and a DC charger input on the front panel that both allows charging from the mains AC and using the cigarette lighter socket in your vehicle. If you're just looking for the best jump starter without extra features, then here's an offer to take a closer look at. It's not cheap though, but it comes with a high-output 22-Ah AGM battery. In addition to that, it features a USB port for charging mobile devices and offers a peak power of 2,200 Amps. It also has 4-gauge, 50-inch jump cables, making it very compliant to high industry standards. 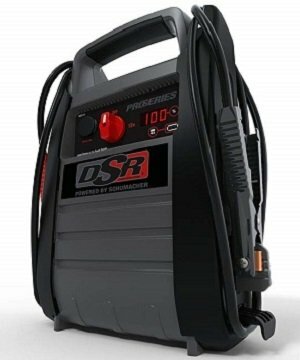 The downside is that while jump starters powered by lithium-ion batteries weigh just about a pound, this Schumacher DSR114 weighs about 24 pounds with its AGM battery. Another issue is that Schumacher offers just a single-year warranty on this device, but it also comes with a digital display and offers safety features like reverse connection warnings. In addition to that, it includes many extra features like a compressor, which produces 120 PSI compressed air for pumping tires, three USB charging ports, and a 12-Volt DC outlet. It also features a bright torchlight that can pivot 270 degrees around, plus an illuminated pressure gauge for tire pumping on the back of the device. One unappealing part of this jump starter is that it uses just three LED indicators to show battery charge levels, and the second one is that you have to charge it every 30 days to keep up its charge. Choosing the best jump starter depends on your ability to understand the different features in a typical model. By weighing the differences between the different devices, you are then in a position to make an informed decision. Following are these important factors that you need to keep an eye on when deciding. The use of different types of technologies has brought about two major types of jump starters. The first is the Plug-in jump starter, while the second type is the jump box. Here's a more detailed look at both. Plug-In Jump Starters. This type is so-called because the jump starters need being plugged-in before they can work. In other words, they depend on the mains AC of your home or other building and are, therefore, not really portable. Some deliver a few Amps to trickle charge your car's battery, while other designs offer a start feature to directly crank your car's engine to a start. Jump Boxes. This breed of jump starters are completely portable and usually made up of sealed, maintenance-free batteries, with attached jumper cables. Although initially made from lead-acid batteries, lithium-ion has been recently finding its way into this scene. Many jump boxes also include different features like providing charging ports for mobile devices or being able to charge a car battery as plugged-in jump starters do. Such a device will help to keep up your car battery's health. There are different power requirements for the two types of jump starters, so you'll need to keep that in mind when making your choice. Plug-in chargers don't need plenty of current to work because batteries are better charged slowly. So, a top power output of 6 to 10 Amps is okay for this type. When it comes to jump-boxes though, you'll need plenty of power to crank the engine and the exact amount of power that you need depends on the size of the engine. This type usually has peak power outputs of many hundreds and even over a thousand Amps. With jump boxes, you also want to look at its storage capacity, if you plan on using it as a power bank to charge your devices on the road. Battery capacity is usually given in mAh, with the higher the number being the larger the battery's capacity. Cable length isn't of much importance when it comes to jump-boxes, but they do matter a lot when it comes to plug-in jump starters. This is for the simple reason that they need to connect to your car's battery and to a mains socket at the same time, so you should keep that in mind. 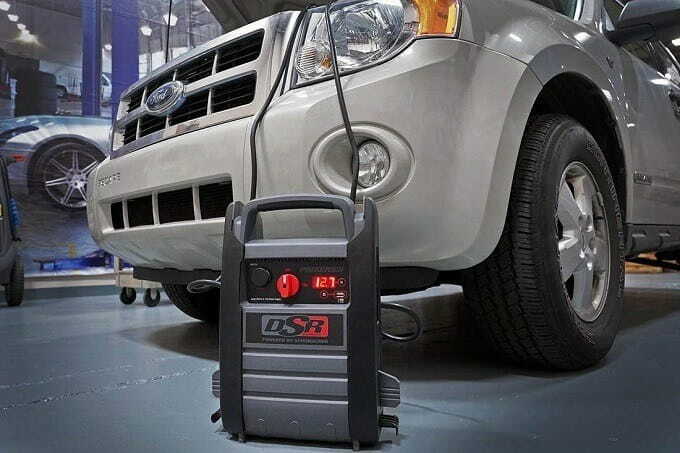 A smaller jump starter is easier to use than a larger one because it can better fit into the glove compartment, it's easier to handle and carry around, and it's lighter, making it more user-friendly. You'll have to make your personal choice here between price, power delivery, and portability. Modern jump starters come with so many extra features to make them worth having around in the car. For instance, many also work as power banks and others offer one or more USB ports to charge your phones and tablets. In addition to that, some offer tire inflators with high-pressure air delivery as an emergency tool and you'll also find those with different circuit protections like over-voltage and wrong-polarity protection. We've come to the end of this jump starters review and you've seen all the interesting offers out there in the market, including those with fancy extra functions and others designed to deliver the most power. You've also seen those designed for compactness and the others for affordability. As you can see, therefore, there's no single best jump starter in the market. It's just left for you to choose the offer that best meets your budget, power, and extra features needs.